Trauma I should be champion by now - maybe another title? Maybe just borrowing it from his son? 2) Caballero De Troya, Capitán Furia, Terrorista b Black Cat, Murcy Jr. II, Murcy Sr.
unannounced dark match; not expected to air but they'll be on the Naucalpan show. Dark Dragon and Fenix were debuting here. There's a lot of people who've used the name Fenix, and this is probably not any of them. Hijo del Tirantes helped the rudos with a fast count. Billy feuded with Gran Apache, and Tirantes got involved there as well. Super Fly now has a red headband, like Octagon. 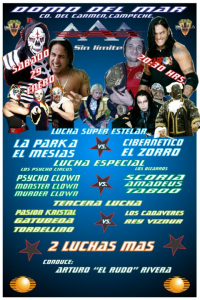 Rudos mocked the tecnicos, tecnicos rallied, and the rest of the Milicia ran in for the DQ. They took Octagon's mask again. Murder Clown flying elbow drop on Amadeus for the win. Zorro came out after the match and argued with Charly about the whole iron mask thing. Rudos got a lot of help from Konnan. A Zorro superkick to Mesias won. Charly, wearing the Bizarro mask, ran out and attacked La Sociedad after the match, then hung out with the tecnicos. Event Notes: In between the third and fourth match, La Sociedad came to the ring. Zorro revealed new visions of the future: a tyrant would fall, and we'd see the return of the iron mask Charly imprisioned him in. Konnan was concenred he was the tyrant, but Zorro said he did not know the identity, only that it would happen. Konnan threanted Dr. Wagner for his statements at Guerra de Titanes. Event Notes: Box Y Lucha awards given out: Mecancio Infernal as best (local) rudo and Angel Celestial as best rudo.